Israel: Syria Has Been Using Chemical Weapons : The Two-Way An Israeli military official says Syria employed the weapons in a series of recent incidents. The U.S., meanwhile, has said little on the subject and has not made similar accusations against Syria. A top Israeli military official on Tuesday accused Syrian President Bashar Assad's regime of using chemical weapons in recent fighting in Syria. Syria has denied using such weapons. 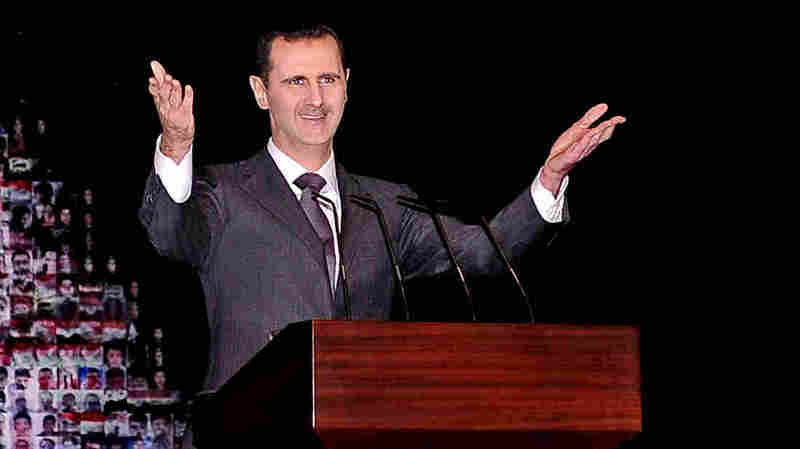 Assad is shown here at the Opera House in Damascus in January. Israel's top military intelligence official said Tuesday that the Syrian government has used chemical weapons repeatedly, and he criticized the international community for not taking tougher action against the Syrian leadership. Israel and the Syrian opposition have on multiple occasions accused President Bashar Assad's government of using chemical weapons in the country's civil war, but have not offered much in the way of evidence. Israeli Brig. Gen. Itai Brun, speaking at a security conference in Israel, gave the most definitive statement so far by an Israeli official. "To the best of our professional understanding, the regime used lethal chemical weapons against the militants in a series of incidents over the past months," Brun said, according to an Associated Press report from Tel Aviv. "Shrunken pupils, foaming at the mouth and other signs indicate, in our view, that lethal chemical weapons were used." Brun appeared to be referring to attacks that took place near the capital, Damascus, and the northern city of Aleppo on March 19, and an attack in the city of Homs on Dec. 23. The Israeli military believed that sarin, a lethal nerve agent, was probably used, Brun added. President Obama, meanwhile, has warned Syria against using chemical weapons and stressed that if they are deployed, it would cross a "red line" and could provoke a U.S. response. However, the U.S. has said only that it is monitoring the situation and has not accused Syria of using chemical weapons. Syria is believed to have a large chemical weapons arsenal, but has denied using them and has on occasion claimed that the rebels employed them. Some Western military analysts have argued that the Syrian military still has plenty of conventional firepower, including aircraft and artillery, and therefore would have no pressing need to use chemical weapons. In addition, analysts note, chemical weapons attacks could increase the likelihood that countries opposed to the Assad regime might intervene more directly in the conflict, which began more than two years ago and has left tens of thousands dead. Following requests by Britain and France, U.N. Secretary General Ban Ki-moon said a month ago that the U.N. was launching an investigation into the possible use of chemical weapons in Syria. However, the Syrian government has largely blocked that effort.